ROSELAND, NJ -- (MARKET WIRE) -- December 6, 2006 -- Private sector employment increased by 158,000 in November, according to today's ADP National Employment Report(SM). 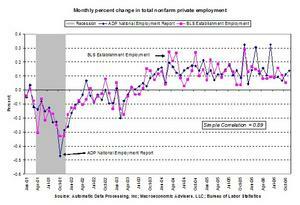 The ADP National Employment Report, created by ADP® Employer Services, a division of Automatic Data Processing, Inc. (ADP), in partnership with Macroeconomic Advisers, LLC, is based on actual payroll data and measures the change in total nonfarm private employment each month. "The ADP National Employment Report is developed from ADP's wealth of knowledge across a wide range of companies in the United States," said Victor Saliterman, ADP Senior Vice President, Marketing. "The employment situation is important to a broad range of audiences and as the leading provider of HR, payroll and benefits administration solutions, ADP is the only company with the scope of knowledge necessary to provide this public service to financial markets." "Total nonfarm private employment grew 158,000 from October to November on a seasonally adjusted basis, according to the ADP National Employment Report," said Joel Prakken, Chairman of Macroeconomic Advisers, LLC. "These findings suggest a modest acceleration of employment in November, following three months during which, according to the ADP National Employment Report, gains in private nonfarm employment averaged a slower 104,000 per month." To obtain additional information about the ADP National Employment Report, access the full schedule of future release dates, and subscribe to monthly e-mail alerts and RSS feeds, please visit www.ADPemploymentreport.com. The December 2006 ADP National Employment Report will be released on Wednesday, January 3, 2007 at 8:15 a.m. EST.